In my prior post Serious Games in Mechanical Engineering Education, I've embedded a superb video, where students learn mechanical engineering principles by incorporating the techniques into a computer program that drives virtual cars in the video game - Burden versus Fun: watch the video and have a taste of it! Mechanical engineering undergraduates at NIU have a unique opportunity to learn how engineering computation and simulation works. In the process, they explore engineering principles by - in effect - playing video games. The project is sponsored by the National Science Foundation. They have co-developed a game called NIU-Torcs, built upon an open-source video game called Torcs. On its surface, the game has the look, feel, and adrenaline-pumping action of a modern commercial video game. At it's heart, though, NIU-Torcs is a sophisticated simulation of automobiles and their components. In one instance, they are using NIU-Torcs as the underlying framework to teach an undergraduate numerical methods course. 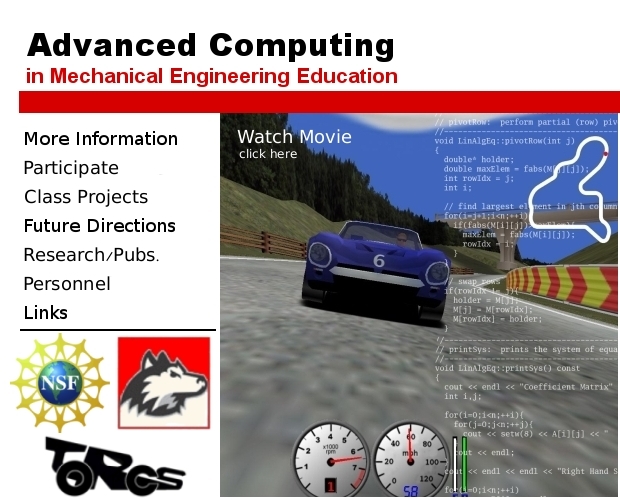 Rather than learn numerical techniques for calculating derivatives, solving algebraic equations, root-finding, et cetera by reading a textbook and working on narrowly defined textbook problems, students learn by incorporating the techniques into a computer program that drives virtual cars in the video game. In addition to an authentic and engaging environment for learning numerical methods, the course gives students an opportunity to further develop their computer programming skills. Typically, mechanical engineering undergraduates take a single procedural programming course, and that's it! They become proficient at writing small programs of narrow scope. While this may have been appropriate in the 1970s when the technology of the day severely limited the sophistication and scope of engineering computing, the landscape today is vastly different. Students now begin learning object oriented programming. They program in teams. They create relatively sophisticated software, consisting of more than a thousand lines of code. They do this in an authentic context that engages engineers. To follow up, we have developed a new course in which students create the simulation of the automobile itself. In the simulations students capture the physics of the suspension, transmission, engine, brake system, tire mechanics, and more. Simulations for all these components are integrated into the larger automobile simulation. Students learn a lot more programming. They dive into automotive engineering. Finally they gain a unique perspective on engineering software. Whereas students typically get experience in using engineering software, the course gives students insight into what it takes to create the software. Rather than a mysterious black box, students gain a better understanding of its capabilities and limitations.